President Enrique Pena Nieto has vowed to fight for Mexico's interests and defend migrants' rights during talks with the new US administration. Next Tuesday he is due to meet President Donald Trump, who has vowed to build a southern border wall to keep out migrants from Latin America. "The solution is dialogue and negotiation. Not confrontation nor submission," he said. Mr Pena Nieto said Mexico would work to keep a trade deal Mr Trump criticised. The North American Free Trade Agreement (Nafta), signed by Mexico, Canada and the United States, came into force in 1994. Mr Trump promised during the electoral campaign to renegotiate its terms. Mr Pena Nieto said Mr Trump's victory was forcing Mexico to redefine its relationship with its northern neighbour. "It's clear that the US has a new vision for its foreign policy," he said in a speech in which he outlined his new foreign policy goals. "Mexico has to act to defend its national interests." He said Mexico would get closer to Brazil, Argentina and other Latin American countries. He also announced plans to conclude free trade negotiations with the European Union and said Mexico was "ready to begin negotiations with Britain" when it formally leaves the EU. Mexican and US government officials are this week beginning negotiations to redefine relations between the two countries. During the electoral campaign, Mr Trump promised to build a wall on the border to control immigration and drug trafficking. In his rallies, he repeatedly said that Mexico would pay for the wall. 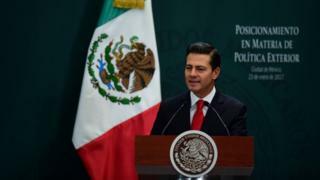 Mr Pena Nieto said Mexico "does not believe in walls, but in bridges". "Mexico is in a privileged position between the Atlantic and the Pacific Oceans. It is a natural bridge for trade with other regions," he added. He said the number of Mexican citizens crossing the border with the US had dropped sharply in recent years. Most illegal migrants entering the US via Mexico now come from other countries, in particular from Central America. The Mexican president listed 10 goals Mexico will seek in the negotiations, including a commitment by the US to respect the legal rights of Mexican citizens and safeguarding the free flow of remittances, which amount to about $25bn (£20bn) per year. Comprehensive negotiations, including not only trade, but also issues like migration, security, terrorism and drug trafficking. Correction 24 January 2017: This article mistakenly gave the figure for the remittances sent to Mexico from the US as $4bn when it is about $25bn.